Description: An EB UP freight motors up the grades east of Clinton Iowa. 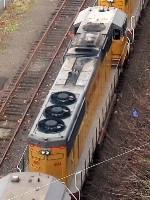 Description: Heavy power at South end of Greenville yard. Yard switcher 5026 to the left. Description: Warrior bonnets in the south! Description: Eastbound UP freight with four engines in the lead and two on the rear as distributed power. Description: Was left with the container train while UP 5177 and 5204 headed WB. They came back about an hour later than hooked back up then proceeded WB. I ran towards Fremont on US 30 but I didn't see any trains stopped so I don't know what was being done. Description: A CSX SD80Mac 1. Not in Coal Service 2. Not out East 3. On a UP frieght. Very Rare to see this. Description: UP 4161 leads a westbound freight at Maple Park, IL. Description: Eastbound intermodal on the former C&NW. UP still runs left-handed here, just as the Northwestern did. Description: . . . and on the Washington side of the Columbia River is a westbound oil train.